(Nanowerk News) Ultrasound and underwater sonar devices could “see” a big improvement thanks to development of the world’s first acoustic hyperlens. Created by researchers with the U.S. Department of Energy’s Lawrence Berkeley National Laboratory (Berkeley Lab), the acoustic hyperlens provides an eightfold boost in the magnification power of sound-based imaging technologies. Clever physical manipulation of the imaging sound waves enables the hyperlens to resolve details smaller than one sixth the length of the waves themselves, bringing into view much smaller objects and features than can be detected using today’s technologies. The key to this success is the capturing of information contained in evanescent waves, which carry far more details and higher resolution than propagating waves but are typically bound to the vicinity of the source and decay much too quickly to be captured by a conventional lens. Zhang is the corresponding author on a paper reporting this research in the journal Nature Materials. The paper is entitled, “Experimental Demonstration of an Acoustic Magnifying Hyperlens.” Co-authoring this paper with Zhang were Jensen Li, Lee Fok, Xiaobo Yin and Guy Bartal. 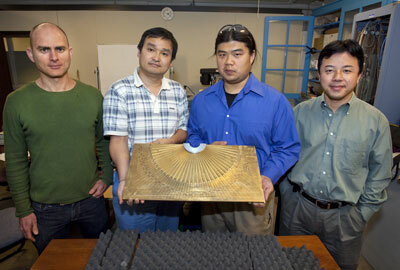 Zhang and his co-authors fashioned their acoustic hyperlens from 36 brass fins arranged in the shape of a hand-held fan. Each fin is approximately 20 centimeters long and three millimeters thick. The fins, embedded in the brass plate from which they were milled, extend out from an inner radius of 2.7 centimeters to an outer radius of 21.8 centimeters, and span 180 degrees in the angular direction. In the world of optical imaging, hyperlensing is enjoying a hyper rage. Fabricated from metamaterials - composites of metals and dielectrics whose uniquely engineered structures give rise to extraordinary optical properties - hyperlenses make it possible to overcome the so-called “diffraction limit” by imaging features that are significantly smaller than the wavelengths of incident light. Zhang called the capturing of information carried by evanescent waves “the Holy Grail of optical information” in 2007, when he and his research group announced a hyperlens made from nanowires of silver and aluminum oxide that was able to use visible light to image objects smaller than 150 nanometers, well below visible light’s diffraction limit of 260 nanometers. Sound waves are also hampered by an intrinsic diffraction limit when deployed for imaging purposes - objects that can be seen with conventional acoustic imaging are limited by the length of the sound wave. Once again, Zhang and his colleagues have overcome this diffraction limit by employing carefully engineered wave dispersion surfaces. This time they’ve demonstrated the first broad-band low-loss imaging with large magnification, where evanescent waves carrying information about subwavelength features are gradually converted into propagating waves. The current version of their acoustic hyperlens successfully produced 2-D images of objects down to 6.7 times smaller than the wavelength of the imaging sound wave. Now Zhang and his team are up-grading their technique to produced 3-D images. They are also working to make their acoustic hyperlens compatible with pulse-echo technology, which is the basis of both medical ultrasounds and underwater sonar imaging systems. “Directly applied to current ultrasound pulse-echo technology, the hyperlens would allow the use of lower input frequency, which in turn would increase the penetration depth and allow physicians to see, for example, smaller tumors or finer features of larger objects that could help them identify other abnormalities,” Zhang says. Acoustic hyperlens could be applied to underwater sonar as a focusing device that would allow more complex and precise custom waveforms to be created while still maintaining the power of the propagating source.